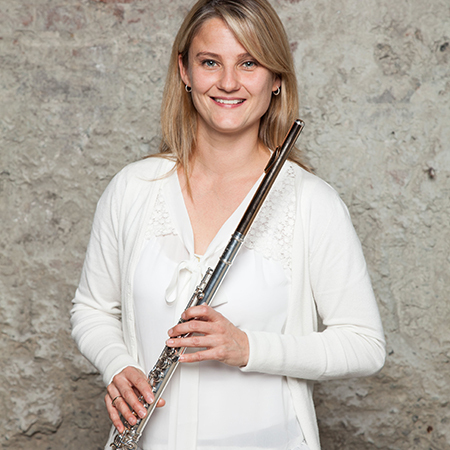 Rosanne Wieringa* began playing the flute at the age of twelve and, after graduating from high school, she continued her formal training at the University of Toronto, the Glenn Gould Professional School, and the New England Conservatory of Music in Boston. Her teachers have included Nora Shulman of the Toronto Symphony, Jeanne Baxtresser of the New York Philharmonic, and Kathleen Rudolph, former Associate Principal Flute and Piccolo of the Vancouver Symphony. An active solo and chamber musician, Rosanne has appeared as a soloist with the Regina Symphony, the Georgian Bay Symphony and the Vancouver Symphony Orchestra. She is a member of the Vancouver‑based Admare Wind Quintet, and frequently performs in the Sweetwater Music Festival in Owen Sound, Ontario and the Gros Morne Summer Music festival in Newfoundland. Rosanne maintains a busy studio for all ages at home and at the VSO School of Music. Her youngest student of all is her 2-year old daughter, who is a kazoo virtuoso!